What beer lover would turn down the offer to write about beer in return for the most common remuneration of such effort (beer)? Isn’t that the only reason why beer writers exist? A new trophy was recently announced by the annual Australian International Beer Awards (AIBA), which might help validate a beer writer’s existence – the AIBA Media Award, sponsored by The Crafty Pint. The award will recognise Australia’s top media talent specialising in beer and brewing. Entries are open to anyone one over 18 who is resident in Australia and has published beer-related work between January 1 and December 31, 2013, in the media (including print, radio, TV, film, online or social media). This is good news. It provides those who are passionate about communicating and analysing beer with more reason to do so, other than free beer. What is “craft beer media”? 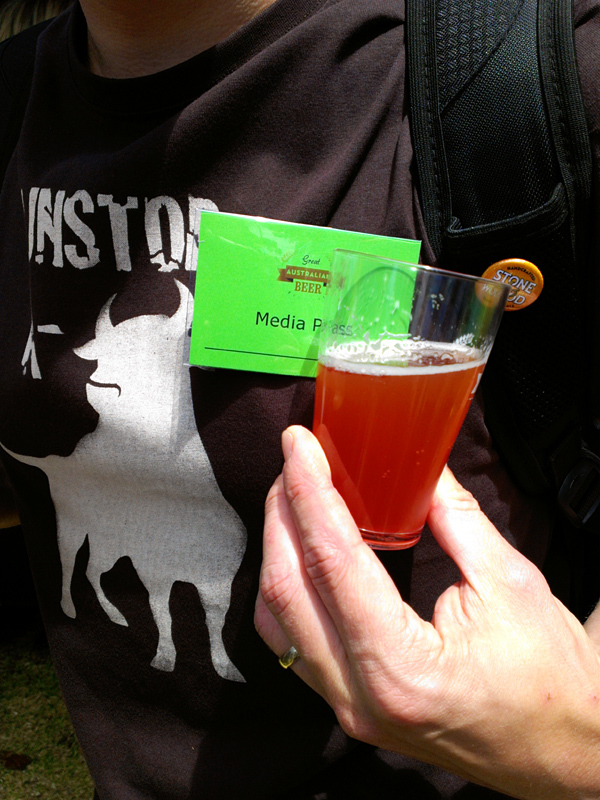 Beer media is a field I play in – with this blog and social media, as well as my work with Australian Brews News – but I’m undecided as to whether I’ll make a submission to the Award. Initially, I avoided all thought of entering. I don’t believe my output is anywhere near the class or contribution factor achieved by others in the Australian beer media landscape. I don’t consider myself talented or deserving of such recognition. For one, I write too much junk. Also, I’m not well schooled in grammar. Ultimately, I just enjoy sharing the experience of better beer, so I write about it, and it’s turned into a fun pseudo media job. Then again, as beer writing is something I’m keen to continue pursuing and advancing, the opportunity to have my work read by a panel of judges is enough incentive to enter the competition and a positive step for my beer writing passion. Although, as a believer in the continuing relevance and higher impact of traditional media, I’d like to see this award go to someone with an audience from print media/newspapers, TV or radio. Who is Australia’s beer media talent? Over the last decade or so, many would have answered: Willie Simpson, and quite rightly so. 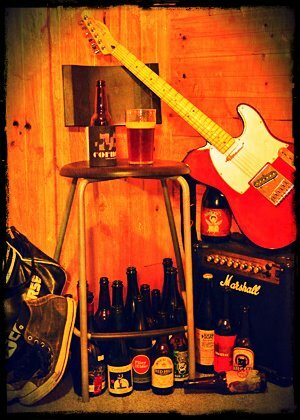 But Willie is now in semi-retirement from beer writing, as he focuses on his brewery, Seven Sheds in Railton, Tasmania. He produces excellent beers, such as the Kentish Ale, which we don’t seen enough of on Australia’s mainland. Matt Kirkegaard (BeerMatt) – freelance writer, beer educator, industry commentator for TV and radio, Editor of Australia Brews News. Matt is currently the most interesting writer in Australia’s beer media. Yes, full disclosure, I have a connection to Matt and write for his outlet, Australian Brews News. Hence, you may consider me biased. Nevertheless, I eagerly read everything Matt writes about beer because he is passionate and very well informed. Most of all, virtually everything he produces causes a spark that lights a wildfire of conversation and engagement about Australian beer. We understand the local beer market and industry much better, thanks to Matt. James Smith (The Crafty Pint) – journalist, freelance writer, Australia’s craft beer cheerleader (excluded from the AIBA Media Award because he is the sponsor) – James is a voice on beer that is worth listening to…any time and any where. More importantly, his actions have spoken louder than his words, resulting in significant promotion and advancement of the local craft beer community through initiatives such as Good Beer Week, The Crafty Pint and now Craft Beer Rising. I suspect that, over the last 5 years, James has brought more people into craft beer than any other Australian beer media or writer. Maybe one day this Award will be named in his honour. Max Brearley – freelance writer, blogger – Australian beer bloggers became familiar with Max through his London based Pub Diaries blog. Then he moved to Perth, Western Australia, and now provides us with excellent writing about beer and food in the west. Topics that usually bore me, Max makes very readable. James Atkinson – journalist, industry specialist, Editor of The Shout – As far as trade news goes for the Aussie drinks industry, James has the scoop and the contacts. He covers all ends of the beer market, and the articles never overstay their welcome. Glen Humphries – journalist and blogger – Like me, Glen is still learning about the beer world, which he shares by blogging his craft beer journey of discovery. He must have read a “Blogging & Social Media 101” book written in late 2012, because he has prolific output with text book strategy, blogging almost daily on Beer is your friend with routine topics for each day of the week. His best work is reserved for the Illawarra Mercury, where we contributes features and blogs about the local beer industry. I’d also like to echo the Ale of a Time podcast (‘Sode 4: Mass Hipsteria and Factual Inaccuracy) regarding the excellence of Pete “Prof Pilsner” Mitcham. 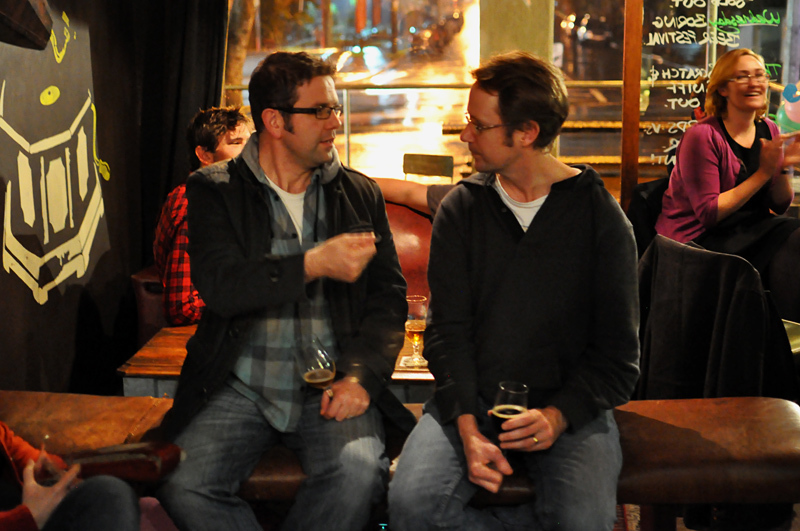 Pete Mitcham – beer writer, educator, host, good bloke – Pete is one of the best communicators of beer in Australia. He can talk about beer to anyone, from beer geeks to unmovable old-school mainstream beer drinkers. You will often find Pete hosting panel sessions and workshops at beer festivals and events, and his sessions are always worth attending. He is knowledgeable, entertaining and always interesting. We often groan at Pete’s “dad gag” routines, but he is a master of communicating the simple pleasures of enjoying beer. Pete always has a story that will help you enjoy your beer more. I’ve been fascinated with podcasts for about 18 months now, hooking in daily to hear people talk without restraint or regulation. It’s reached a concerning stage where I start suffering withdrawal if I don’t get a weekly fix of TOFOP or The Nerdist. I’ve gravitated to comedy podcasts, but I also listen to whatever Aussie beer podcasts I can find to keep up-to-date with all that is happening. Ale of a Time – Melbourne’s Luke and Dave catch up every 2 weeks to talk about what’s been happening around them in the beer world. They’re only 4 episodes in, so Dave and Luke are probably yet to find their best rhythm and comfort zone, but they are polished (comparatively) and thoughtful, it’s easy listening. I’ve enjoyed every episode so far and recommend this podcast to anyone with local knowledge of the Melbourne beer scene. Inebriation Nation – radio quality sound and voices from a show born on the Sadly Lacking Radio internet radio network. It features a characterful Sydney based crew including US expats and the wonderfully nonchalant Drunk Kevin. They are all relatively new to Australian beer, yet present very balanced and non-geeky discussions about the industry thanks to their global experiences and easy-going world view of beer. I also follow and enjoy the blogs found of the right-hand side menu of this site, under “Aussie Beer Bloggers”. What are the tired stories, the “hack” news/analysis/commentary topics that established bloggers and beer writers should now avoid? Brewing collaborations – an easy topic to consider “news”, but the act of a collaboration is no longer news, so if it’s worth writing about, find another angle that makes it unique/new/interesting/important. The style debate – what relevance does this have to drinkers and readers? Exact beer styles are important for subjectivity in competitions, but outside the judging circuit…style arguments are BORING and often don’t tell you anything about why you should drink the beer. Can a Black IPA just be a “hoppy dark beer” (with a flavour adjective for the hop profile) and if not, how would that change whether I enjoy drinking it or not? Gender and beer – equality is important, but making news out of gender in relation to beer and brewing is sending us backwards rather than forwards. How is it productive to make anything about beer gender specific? Anonymity – the anonymous internet is dead. If you want to be listened to, if you want to have a voice and be a part of the debate…be identifiable to give your output credibility. If your excuse for using anonymity is because you’re concerned about the security of your identity online, then get off the internet. What are the topics that need more attention? Marketing the truth – beer related PR and marketing can be brilliant and entertaining, it doesn’t need to be false/wrong/lies/spin. If you see bad beer marketing, write about why it’s wrong. If you see beer marketing that is excellent, write about that too. Let’s give beer better PR through clever marketing. Beer yarns – share the great tales of human experience when beer is present or the destination. What are the beer topics that you’d like to see written about more and less? Tags: AIBA, beer writing, beers, blogging, media. Bookmark the permalink. You know what’s funny.. I’m reading this post and thinking “I wonder if I made that list” while at the same time going “don’t be so frigging stupid, of course you’re not on that list. It starts with Matt Kirkegaard and James Smith. No goddamn way am I anywhere near close to being on that list”. Ummm, and there I am. Wow. I am truly humbled – and unbelievably flattered. Cheers for making my weekend. And, as for the social media strategy, I’ve taken what I’ve learned from looking after the website at work and applied it to the blog. Cheers Glen. Not surprisingly, the people who I think are providing valuable content are those with experience in traditional media, like yourself. We’re all at different stages of our “beer journey”, but that doesn’t forgive lack of substance or considering both sides of the story. There are some bloggers who write stupid things because it’s their opinion, which is not worthy of airing outside of a drunken pub gossip session. So I appreciate anyone who, regardless of their knowledge level, blog balanced and thoughtful content in a readable format, and you definitely tick that box. Ahh, yes, that makes sense. Your strategy is from “News media websites 101”, the book that sits next to the book I mentioned. haha. Keep up the great work. I think it’s a little harsh to criticise bloggers that write ‘stupid things because it’s their opinion’. Those things might not be stupid to them and isn’t that a key point to blogging – an individual opinion? For sure there are some beer bloggers that are more, say, eloquent than others but a great mix makes for a wonderful Australian beerblogdom! Sorry, I should have clarified the context of “stupid”. Stupid in this context of blogging means writing things that are disrespectful, mean, hateful, aggressive and so on…when you’re only a casual observer and therefore generally not qualified to attack a concept/item. I’m all for individual opinions, hyberbolic statements, gushing, and saying it how it is and just because you can (of course, that’s why I started blogging)… but not in a way that disregards the other side of the story just because you don’t like it or because you think your way is the only way. There’s better, more productive, things to write about instead of just attacking others that you don’t know. If you’re going to publish something for the world to read forever, at least think about it for a moment first. Great read and no offense taken James, that is where I have focused my efforts over the past few years… watch this space though!! Fantastic that there are so many passionate beeries out there taking the time and making the effort to communicate to the broader public. Amen. These are generally the same hateful, venom spitting, uninformed individuals mentioned in comments before me. I think this award is perfect. It will definitely step up the game of some beer media folks out there.